Home/Experience, To Do/What’s on your bucket list? It’s time for you to discover Mount Gambier, and Australian Traveller agrees! Australian Traveller Magazine has recently launched this month’s Bucket List Edition, and Mount Gambier is on the list! The incredible experiences available within this ‘stunning regional South Australian city’ are highlighted throughout the article. Whether it’s on foot through the forest tracks, mountain biking on trails, 4×4 driving in dunes, or via a slow drive through stunning countryside, the region can be explored by all. The article highlights the fun and interactive Bucket List section of our website, which allows you to create your very own bucket list for the region. Get your hands on a copy of Australian Traveller’s Bucket List Edition here. If you haven’t already, make sure you go check it out the interactive Bucket List section of our website. Is a really fun way for you to create your own must-do list of activities. There are a whole range of experiences to choose from that are located across the region. Whether you’re a foodie, a nature lover, or a history buff, you can create your own unique bucket list. Love a challenge? Try to collect as many badges as you can. 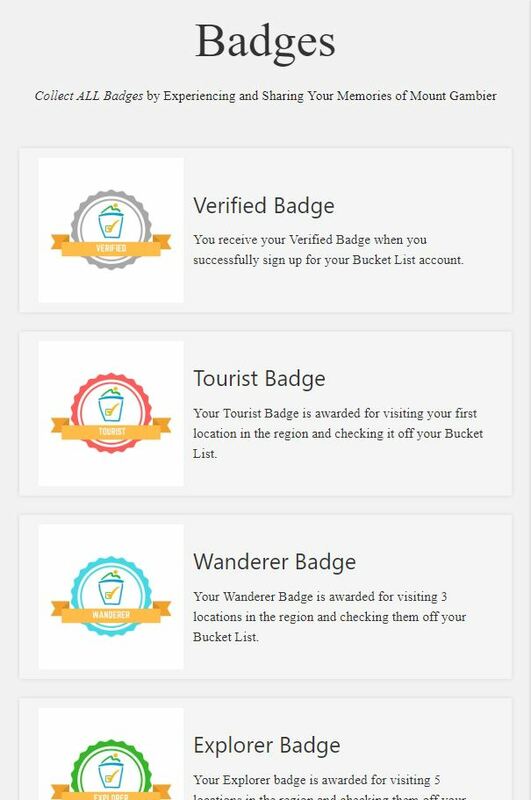 You can earn badges by experiences and sharing your memories of Mount Gambier. Create your bucket list now!